Four apps that make checking the weather on your iPhone quick and easy. I don’t like spending a lot of time inside weather apps. Instead, I’d rather just swipe down and view current and impending conditions within the Today view section of Notification Center. That’s why, when looking at weather apps to try, one of my criteria is that whatever one I choose, it comes complete with widget support. Depending on what kind of weather data you need, these weather apps currently have the best weather widgets for iPhone. Dark Sky is minimal and loads incredibly quickly. Dark Sky offers some of the best up-to-the-minute weather forecasts available, pretty much anywhere. The app itself shows a five-day forecast and a nice timeline of what you can expect over the next 24 hours. When it comes to inclement weather, Dark Sky has been my most-trusted app for a long time. I also love the simplicity of the weather widget, and typically place it right at the top of my Today view. It’s nothing more than a small sentence telling me what I can expect over the next hour. When driving from point A to point B, or getting ready to leave for the day, this is all I need. And since this widget is so simple, it loads a lot faster than some of the others, which you’ll appreciate in a pinch. Weather Nerd offers three different widgets to choose from. 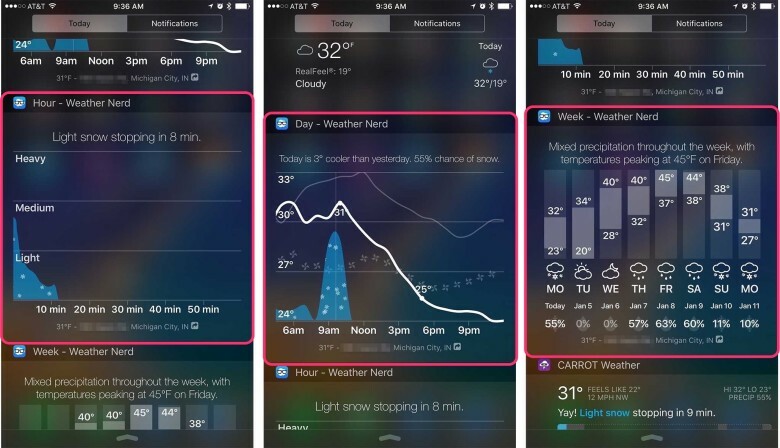 Weather Nerd packs a powerful punch both in the app, and inside the dedicated weather widgets. Yes, I said “widgets,” because Weather Nerd has not just one widget, but three — hour, day and week. All three widgets are incredibly detailed and easy to read. My favorite is the week view; I keep it toward the bottom of Notification Center. This way, if I want to view extended forecasts with a swipe, I can. But since Notification Center loads widgets at the top first, Weather Nerd doesn’t bog down load times of other widgets I care about more. As for the Weather Nerd app itself, it’s beautifully done and supports almost every weather forecast feature you could ask for. Most locations worldwide are supported, with forecast data pulled in from forecast.io, one of the most trusted sources. Another nifty feature that sets Weather Nerd apart is its daily comparison, which tells you how today compares to yesterday. That’s nice when preparing for the day ahead. 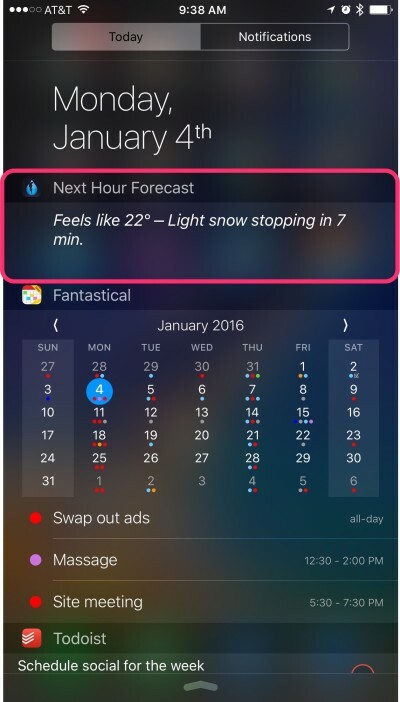 CARROT offers weather info with an attitude. CARROT Weather gives you more than just a weather forecast — it gives you attitude. If you like any other CARROT products, you’ll love this one (it’s actually my favorite of them all). On the main screen of CARROT Weather, you’ll see a current forecast, in CARROT-speak, which usually means the world is ending in some way, no matter what the weather is. You can also view forecasts and, of course, add a widget to your Today view. 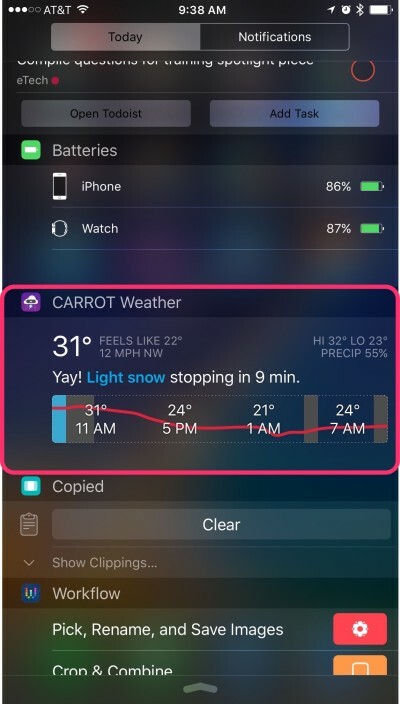 CARROT’s weather widget will give you a one-sentence summary of the next hour as well as a nice trend line to show you what kinds of temperatures you can expect throughout the remainder of the day. The top and bottom areas of the weather widget show you highs and lows as well as current temperature. If you don’t need anything too complicated and you could do with a little laugh each day, CARROT Weather fills the bill and then some. Put forecasts or radar into Today view with Weather Underground. Weather Underground is one of the most comprehensive and trusted weather apps I’ve ever come across. The app itself is well put together and provides a lot of information that many other weather apps don’t, such as pollen and ozone information. I appreciate this when allergy season comes around. You get a choice of two different weather widgets with Weather Underground — radar and forecast. I don’t use the radar widget much, but the forecast widget is easy to read and loads incredibly quickly. It shows you what weather station it’s pulling information from, current conditions, highs and lows, and a graph of the rest of the day’s weather patterns. As for the radar widget, just hit the play button and Weather Underground can show you current conditions right inside Notification Center, no need to launch the app itself. Whenever we have bad storms or tornado warnings, I find myself adding this widget temporarily so I can follow along more conveniently.